A comic like Chester Brown’s Ed the Happy Clown isn’t one that’s easily discussed in polite company. It’s replete with scatology, hyper violence, and vomiting penises that look like Ronald Reagan. 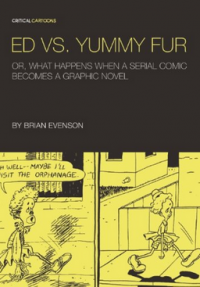 “[I]t’s hard to recommend Yummy Fur or Ed the Happy Clown to just anyone without offering a few caveats/qualifiers/warnings,” writes Brian Evenson. Nonetheless, the book is worth talking about—even more specifically, the journey from mini-comic to “a graphic-novel,” which is what Brian Evenson does with incisive detail in Ed vs. Yummy Fur or What Happens When a Serial Comic Becomes a Graphic Novel. Brian Evenson is the perfect critic for the first installment of Uncivilized Books’s Critical Cartoons series (which also promises a book of criticism on Carl Barks’s work on Donald Duck comics—now available for preorder). As an author renowned for fiction and scholarship that bridges the gap between high- and low-brow cultures—after all this is the author of both Altmann’s Tongue and two Dead Space novelizations—Evenson lends a sense of legitimacy to Ed the Happy Clown as he meticulously examines Chester Brown’s work. Comic books—especially alternative mini-comics—are seldom the subject of serious literary criticism. I can go on and on about the injustices of the Ivory Tower-ensconced literary elite, but Evenson does this with far more aplomb throughout the work, deploying asides questioning the very nature of a “Graphic Novel” versus a comic book or “a graphic-novel” as well as quotations from other critical greats such as Douglas Wolk (although Evenson’s dissection of Wolk’s previous criticism of Chester Brown also becomes a point of contention in Ed Vs. Yummy Fur). Brian Evenson contends that Chester Brown’s early work—albeit as crass as possible—is important because it redefines an entire genre of sequential art. Evenson places Brown within the same pantheon of deconstructive, comic book auteurs Grant Morrison and Alan Moore, but what’s even more notable than Evenson’s thesis is his own redefinition for what literary criticism can do. Criticism encourages a level of scrutiny that, ultimately, raises the original work up, regardless of its individual merit, and this is exactly what Evenson has done.